A fun summertime activity...playing in the water! Today was an exceptionally hot day where we are (the desert of Washington State), so we thought some water fun was in order! 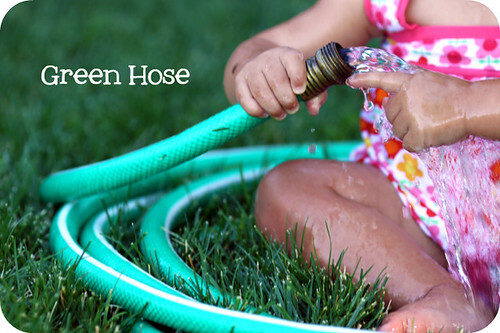 But, instead wading around in pool water, we thought it'd be fun to see how Josefine took to the hose. She had a pretty fun time...sticking her finger into the spout and making the water spray all over her! Looks like we found ourselves a new summertime toy!